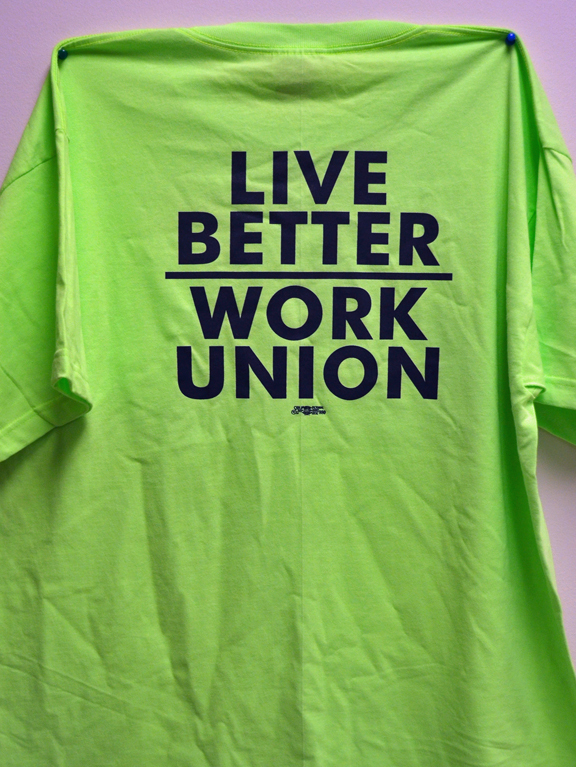 Shirts worn by Building Trades union members at Bonfe’s employment open house. Bonfe’s might want to consider a new recruiting strategy. For the second year in a row, the non-union mechanical and electrical contractor invited members of area Building Trades unions to attend an open house for prospective employees. And just like last year, Bonfe’s recruiters spent most of the open house trying to keep union members out. After receiving the invitations, a group of 11 unions teamed up to reserve a room at the Embassy Suites in Bloomington, where Bonfe’s held the open house Tuesday, looking to “piggyback” off the non-union contractor’s promotion. “We just saw an opportunity where workers might be walking in and looking for jobs,” Ironworkers Local 512 representative Mike Loftus said. Of course, Local 512 and other Building Trades unions offer more than just a job. Unfortunately, the Trades’ effort to offer job seekers a choice met stiff resistance. First, the Embassy Suites gave the unions a room in a remote corner of the hotel. “You needed a highway map to get back there,” Bill Malecha of IBEW Local 110 said. And when union members attempted to post signs with directions to their suite, hotel staff removed them. “They told us we couldn’t have any signs up, told us we couldn’t hand out any literature,” Dilger said. “The police tried to tell us our shirts were picket signs. And we were told if we handed out business cards – even in the bar – we would be immediately asked to leave. Still, the unions succeeded in diverting much of Bonfe’s energy from recruiting new workers. And the police presence likely didn’t do much for the job fair’s ambience. Bonfe’s once was among the Building Trades’ signatory contractors, but it decertified about six years ago. The company no longer hires union electricians, plumbers or sheet metal workers. Bonfe’s is completely non-union. The group of Building Trades unions joining the effort included some crafts whose contractors don’t compete with Bonfe’s for labor: Ironworkers Local 512, Sheet Metal Workers Local 10, Heat & Frost Insulators Local 34, Roofers Local 96, Pipefitters Locals 455 and 539, Painters and Allied Trades District Council 82, Plumbers Locals 34 and 15, and Electrical Workers Local 110 and 292.